The Orient Line was once one of the most recognisable names on the Australasia route. The Line’s beginnings can be traced back to 1797. Created for the purpose of operating a fleet of steamships between London and the Australian Colonies, it was a venture into the unknown, its success testament to the acumen of its founders, two of London’s oldest shipping firms, Anderson, Anderson & Co., and F. Green & Co. They had extensive shipping interests from the West Indies to South America and the Pacific Coast and owned and operated a fleet of famous clipper ships on the Australian wool trade, when their fleet would bring out emigrants to the colony and sail back laden with prime fleece. Cruise ships today owe a great legacy to the pioneering work done by the Orient Line when it developed and perfected seasonal cruising in 1889 from British ports. 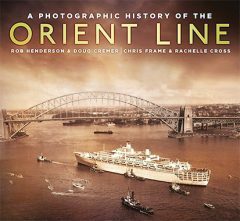 This book showcases the history of the Orient Line with an excellent collection of high quality photographs and I would highly recommend it.